Built by Tirumala Nayak (1623-1659), the Pudu-Mandapa (hall) of the Minakshi temple at Madurai is famous for its numerous carved stone piers. This is one of two bronze piers in the collection that come from a model commissioned by Adam Blackader, a British surgeon stationed at Madurai. They depict the eight-armed goddess Kali and the four-armed Shiva. Other parts of this model are in the Victoria & Albert Museum, London. Bequeathed by the Reverend W. Bentinck Hawkins, 1894. Models of sacred buildings have a long history in Indian art, commencing with reliquaries in the form of little stūpas [EA1978.127]. A number of small stone replicas of the Mahābodhi temple are known and the Museum has a small model bronze shrine, probably from southern Karnataka, on loan. 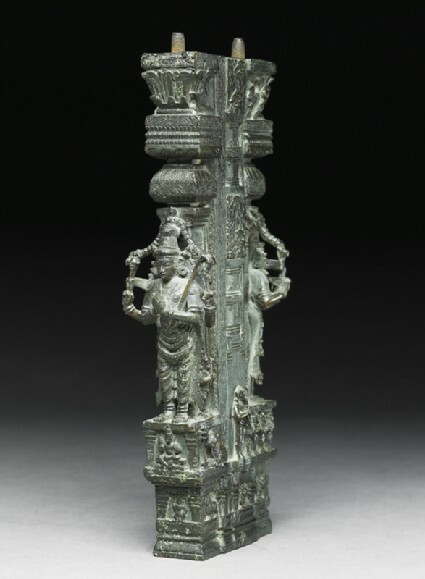 These bronze piers, accurate in every detail, beautifully cast and exquisitely chased, belonged to a small-scale replica of one of the great pillared halls (maṇḍapas) which increasingly from the Vijayanagara period (14th–16th centuries) onward, became one of the principal features of the great temples of Tamilnadu. Other piers, probably parts of the same replica, are in the Victoria and Albert Museum, complete with corbels and linking architrave. 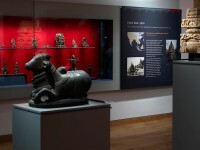 In the same museum, detailed drawings made c.1801–5 to exactly the same scale as the bronzes leave no doubt that the piers are from a replica of the Pudu-maṇḍapa of the Sundarésvara, the great temple of Madura in the far south of India. Indeed, the exact position of the two piers in the maṇḍapa of which the bronzes are models, amongst the total of more than one hundred and twenty, can be ascertained from the drawings. Popularly called Tirumala Nāyak’s “choultry” (shed or hall used by pilgrims, or for the transaction of public business), the Pudu or Vasanta (spring) maṇḍapa has long been one of the most famous buildings in India. Its builder (1623–1659) was the outstanding monarch, famous for his building activities, of the Nāyak dynasty of Madura, which ruled from the mid-16th to the mid-18th centuries and has given its name to the most distinctive style of the final phase of traditional sculpture and architecture in Tamilnadu. For what purpose this model of Tirumala Nāyak’s famous maṇḍapa was made is not clear. So far, it has not been possible to link the previous owner of the Asmolean’s two piers with Lord William Cavendish Bentinck (1774–1839), Governor of Madras (1803) and Governor-General of India (1833). Each pier has a rich and carefully coordinated iconography linking the large end figures to the many smaller relief figures below and on the sides. For example, at one end of the pier on the left [EA1956.674] stands a four-armed Śiva. His two rear hands hold the axe and the deer, almost obligatory for South Indian Śivas, his right hand is in the gesture of teaching (vyākhāna-mudrā), but in his left hand nestles, quite exceptionally, a bird. This presumably refers to a local Madura myth according to which Śiva taught a magic spell (mantra) to a blackbird for protection against stronger species. Hence blackbirds peck at the flowered wreath suspended from the top of Śiva’s crown and on one side of the pier the decoration consists largely of birds and foliage, while below stand little figures of the Nāyaṉārs (Śaiva saints), whose devotional hymns are still sung or recited daily for instructional purposes in the great Śiva temples of the south. On the other hand, the pier on the right [EA1956.673] has an ugra (angry or baleful) eight-armed image of Kālī, with fangs, and the smaller figures below and on the side of the pier are also related to her, female dancers and musicians with hair erect on their heads and even fearsome figures waving a shield and sword, and one with pendulous breasts. 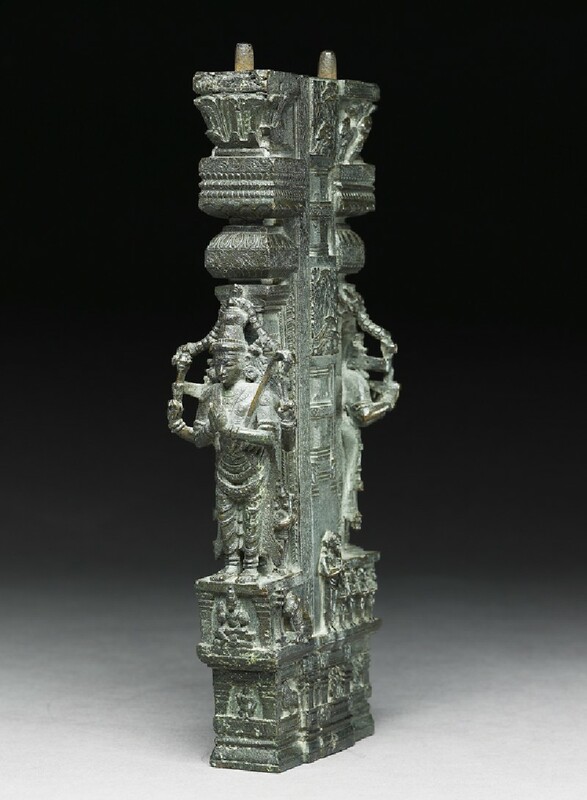 The style of these miniatures, modeled with such meticulous accuracy and attention to detail, unerringly reproduces the style of the originals, that of the Nāyak period based on the far south, with its occasional retention of some of the folk elements absorbed by the preceding Vijayanagara style; but in the main it is notable for its precision and naturalism, echoing in many ways the sculpture of the Coḷa period, but with a new hardness. Faces are often thin, with markedly aquiline features. The elaborately pleated skirt worn by Kālī is a feature of the feminine costume in Nāyak times.